The B4UBUILD.COM home page circa 1998… and yes, that is a 3½-inch floppy disk drive. We are currently working on the single largest project since our founding in December 1997; a comprehensive update of all content and a complete redesign of the entire site. 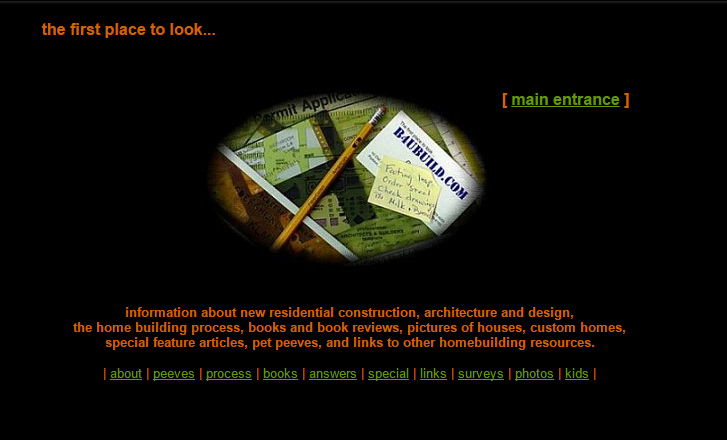 The B4UBUILD.COM website first appeared in December 1997 as the part-time hobby of a luxury custom home builder turned Internet enthusiast. Since then, it has grown into a full-time small business project and a continuous work in progress. New information has been added and updated while the underlying page code was tweaked and modified in an attempt to keep up with ever changing web standards. However, incremental changes have reached their limit and the time has come to overhaul everything. So, that is exactly what we are doing – rewriting articles, reorganizing content, reformatting images and redesigning the layout of more than 400 individual web pages comprising over 6,500 supporting files. Most of this work is being done by one person, which means it will take a few months to complete the process. Rather than hide newly updated content until the entire makeover is complete, we are allowing visitors to see and experience our online home improvement project in real time – warts and all. Throughout this upgrade process, all original content will continue to be available on the ‘Classic’ B4UBUILD website – at my age, classic sounds a lot nicer than old. Accordingly, if we inadvertently send you to a non-existent page, or an unfinished area, or a page layout that doesn’t make sense, you may want to use the link in the menu bar at the top of every page on the new site to try your search again on the Old Classic site.